∼ October ∼ 30 ∼ Trader Joe’s Goddess Dressing! the other week, I came across an item I had seen several times and always found to be somewhat intriguing but never quite made its way into my shopping cart. Finally, it did. Thank God! 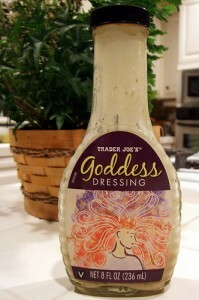 Trader Joe’s Goddess Dressing is what has been missing from my life! I have always been a salad person (well, in my adult life, at least) and have tried out many a dressing and have found most to be quite satisfying. Goddess Dressing wins my all time favorite award! It is mind blowing how delicious it is. I can’t even begin to describe it. Creamy, robust, mouth watering… An understatement! You just have to try it for yourself. This dressing should be a staple in every fridge across America. Across the world! Visit your local Trader Joe’s today to pick up a bottle of your own! OMG OBSESSED!